I recently took part in a Google hangout organized by rabble.ca with a number of social justice advocates to discuss Canada’s future, post-election. It was a worthwhile conversation because it provided some insight into how those who are committed to issues including First Nations rights, worker and women’s rights, the climate, the economy, and democratic reform, anticipate the relationship and interactions with a government that has already fashioned itself as progressive, transparent, and accessible. A theme which emerged from the discussion was the critical need for civil society to maintain its pressure on the government — even one that was giving all the right signals — to ensure that our respective issues remain in sharp focus and that public advocacy maintains its momentum. As several of the panelists noted throughout the discussion, the worst thing that could happen would be for Canadians to now disengage. Avi Lewis, a journalist who has covered American politics, reminded viewers that following the election of President Barack Obama, many Americans simply let out a collective sigh of relief and assumed that everything would be alright. What’s hopeful for those working for a better Canada is that more Canadians voted in this past election than any time in the past 20 years. The level of engagement is high and this offers a valuable opportunity to build and strengthen capacity. Within Canadian Muslim communities, like many other communities, interest in the federal election was intense. Community workshops explaining the election were often full, website traffic to pages dedicated to the issues soared, and social media was offering a steady diet of election memes and factoids for a hungry electorate. And yet, with a new government that has already drastically altered the tone towards Canadian Muslim communities, will Canadian Muslims once again simply turn away their attention from politics though it has real impacts on their lives, and on those of their children? Hopefully not. There are lessons we can all draw on from Aesop’s fable about the hard-working ant and the care-free grasshopper that pertains to the choices Canadian Muslims must now make. Like the grasshopper, Canadian Muslims can simply enjoy the thawing of relations with the new government. Like a new spring, the change of political rhetoric, along with promises to repeal laws like Bill C-24 (revoking citizenship of those convicted of certain crimes at home or abroad), or amending Bill C-51 (the anti-terrorism legislation), are welcome. However, what Canadian Muslims must appreciate is that like the fable, there is much work that still needs to be done to ensure these, and other promises are kept, and that other issues are also attended to. Just a few examples include those who wish to see Canadians detained unjustly abroad returned to Canada; or those who believe that refugees seeking entry to Canada should be assessed based on need, and not on religious affiliation. They need to communicate and advocate on these issues. Those who wish to raise concerns around news of religious discrimination against prison inmates need to be articulating these concerns through the proper channels. Those who have received letters in the mail informing them of a passport suspension or revocation need to have proper avenues made available to seek explanation and/ or argue for reinstatement. And the countless numbers of Canadians who experience racial and religious profiling every time they travel, sometimes prevented from continuing on their way without explanation, justifiably expect the federal government to stand in their corner and demand an explanation from relevant agencies and foreign counterparts. This is the time for Canadian Muslims to act, to move, to rally, and to build the institutions that will seek to protect their rights and freedoms and work to combat Islamophobia which remains reinvigorated following a decade of vilification and marginalization by the former administration. Keeping with the fable, there are many “ants” who have realized all this and who are working hard. They are firm in their convictions that Canadian Muslims need to continue to build resilient and robust capacity to challenge those who would seek to vilify their communities for political gain. Efforts are now underway to create a massive and sustained grassroots movement that seeks to create hubs of articulate, informed, and organized teams in every major city, able to work to advocate with a united voice on issues that impact their communities. This will be about building partnerships between Canadian Muslim communities and various stakeholders – city, provincial, and federal representatives, school board trustees and officials, news editors, directors, and producers, law enforcement agencies, and community health centres, to name a few. And if there is one lesson to take away from this past election is that Canadian Muslims must continue to care about how other communities are faring as well. Whether it’s First Nations rights, or environmental concerns, or those living in poverty, or housing and labour rights, the strongest message from this past election is that working together on social justice issues is key. Canadians of a variety of backgrounds and political leanings came together at various points to mobilize on issues like the muzzling of scientists, like the record on climate change, like the unnecessary focus on the niqab and the gratuitous creation of a so-called “barbaric cultural practices” tip-line. It was this critical mass of concerned citizens that was able to help make a difference at the ballot box. These sustained efforts will require commitments. They will require significant manpower and significant womanpower. And critically, they will require financial resources to ensure their sustainability and professionalism. Our communities must commit to being “stronger together.” Without this commitment, it won’t be long before we figuratively experience another cold and lonely winter. 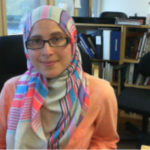 Amira Elghawaby is the Communications Director at the National Council of Canadian Muslims (NCCM). To sign up for updates, or to learn more about NCCM’s 2015-2016 National Empowerment Tour, coming to a city near you, visit www.nccm.ca today. Amira Elghawaby obtained an honours degree in Journalism and Law from Carleton University in 2001. Since then, she has worked as both a full-time and freelance journalist, writing, editing, and producing stories for a variety of media including The Globe and Mail, the Toronto Star, the Ottawa Citizen, CBC Radio, the Muslim Link, and New Canadian Media. In 2012, she joined the NCCM to help promote the civic engagement and human rights of diverse communities.